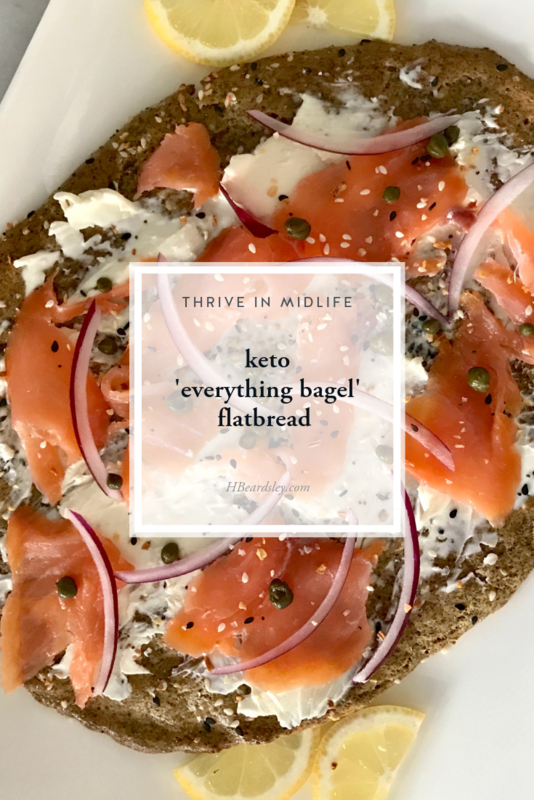 Yes, you can make yourself up an easy low-carb flatbread in 15 minutes and top it with all your favorite bagel things without sabotaging your low-carb fat-burning game. It all starts with my basic Keto Flatbread recipe, which has just 3 ingredients: ground flaxseed, eggs, and sea salt. Just mix those up in a bowl and then spread it out with the back of a spatula on top of a parchment-lined sheet pan. Top with Trader Joe's Everything but the Bagel Sesame Seasoning Blend (or click here to make your own) and bake it for 15 minutes. After it cools for a minute, add your favorite bagel toppings. This flatbread has cream cheese, nova, thinly sliced red onion, capers and a squeeze of lemon. Flaxseed must be ground in order for your body to be able to utilize the nutritional benefits-and there are so many in flax seeds! 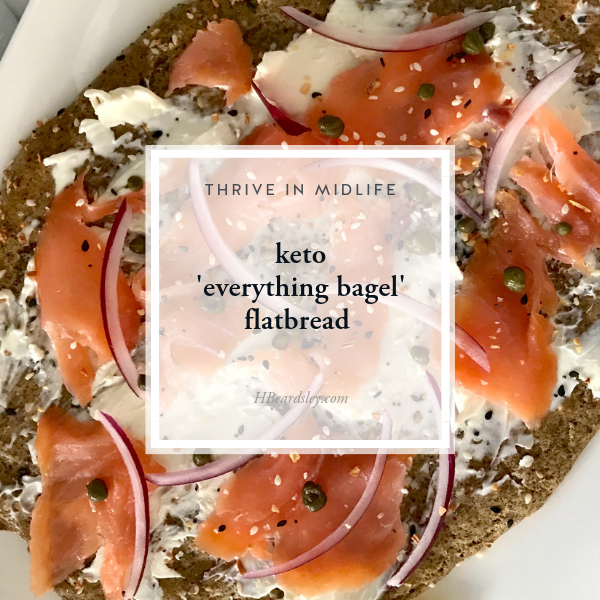 It's high in omega 3's, potassium, magnesium, B vitamins, and has a ton of fiber, which is great for making this flatbread low-carb. Since fiber is not digestible & isn't absorbed, you don't count the carbs from fiber when figuring your carb count. A serving is 1/2 a flatbread and has just 2.3 net carbs. Heck, even if you eat the whole thing like I did this morning, it's still very low carb at just 4.6 net carbs for flatbread. Let the happy dancing ensue. 1 TBS. . Trader Joes Everything But The Bagel Sesame seasoning Alternatively add your own sesame seeds, poppy seeds, sea salt flakes, dried minced onion, &/or dried minced garlic - click here for the recipe. Stir together flax seed, eggs, and sea salt in a bowl until well combined. Pour batter into center of the parchment lined sheet pan. Using a spatula or the back of a large spoon, spread the batter out into evenly into a large oval shape. The batter should be about 1/4" thick. Shake Everything But The Bagel topping over the top of the batter to your liking. Place sheet pan in the oven on the lowest rack and bake for 12-15 minutes, or until the edges have nicely crisped and flatbread is firm but still flexible. Allow flatbread to cool for 5 minutes. Add your favorite bagel toppings to your liking: smoked nova, cream cheese, thinly sliced red onion, capers, and a squeeze of lemon juice over top. If you have coarse ground or whole flax seed, run it through your food processor or blender in order to finely grind it. It should resemble the texture of sawdust. This flatbread recipe serves two. Nutrition information is for 1/2 flatbread recipe only & does not include nutrition information for the Everything Bagel topping or optional toppings.